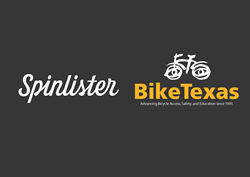 Spinlister, the peer-to-peer global bike share, announced today that they have signed a major sponsorship deal with BikeTexas, an organization that encourages and promotes bicycling, increases safety, and provides a cohesive voice for people who ride bikes in Texas. As part of the deal, Spinlister is providing the financial resources, production material, and logistical support needed to help BikeTexas develop their new bike parking and bike valet programs. BikeTexas will offer these new services to event organizers in a combined effort to promote bicycling in Austin. In addition, they will also be listing their fleet of 150 bikes on Spinlister as a fundraising tool for their organization. Spinlister is encouraging Austin bike owners to list their bikes at http://www.spinlister.com/list to make money and help fellow cyclists in need of a bike. All bikes are insured up to $10,000 against theft or damage. If you would like to rent a bike in Austin or any other city worldwide please visit http://www.spinlister.com. Launched on April 1st 2012, Spinlister is a peer-to-peer global bike share that allows users to rent and list bicycles, skis, snowboards, SUPs, and surfboards from each other in over 50 countries worldwide. With their seamless web, iOS and android apps, built-in security features, and a database of user reviews, Spinlister has won the trust of communities of athletes all over the globe.